Place chicken on the center of the foil, and sprinkle with seasonings. Cover with another large piece of foil. Fold together and seal all four edges of the foil pieces, forming a well-sealed packet. Meanwhile, slice off and discard the stem ends of the bell peppers. Remove and discard seeds. Slice peppers in half lengthwise. Remove foil pack from the sheet, and spray sheet with nonstick spray. Raise oven temperature to 400 degrees. Lay pepper halves on the sheet, cut sides down. Bake for 5 minutes. Flip bell pepper halves. Bake until soft, about 5 more minutes. Meanwhile, cut foil packet to release hot steam before opening entirely. Transfer chicken to a medium bowl. Shred with two forks. Thoroughly blot excess moisture from bell pepper halves. Arrange them on the center of the sheet. Top with shredded chicken, beans, and cheese. Top with salsa, sour cream, jalapeño, and cilantro. 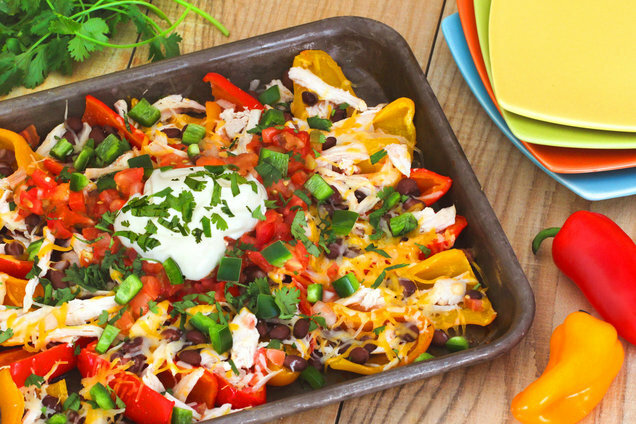 Hungry for More Creative Nacho Recipes? 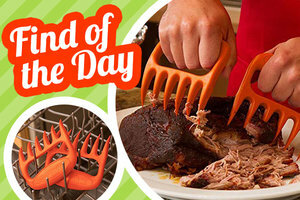 Amazon Find of the Day: Chicken-Shredding Claws! Shredded chicken is the best: on nachos, in tacos, on salads... You name it. And while it’s totally possible to shred poultry with two forks, these best-selling Bear Paws make the process even simpler. Just grab ahold of the ergonomic claws, and easily shred to your heart’s content. Of course, they work for other meats too: pork, beef, etc. We love that they’re BPA-free, heat-resistant (up to 475 degrees), and dishwasher-safe. Bonus: They come in cute colors, like pink, red, and orange! One-click a set STAT. Let’s shred! FYI, we may receive compensation from some of these links. Mmmm, it's National Chocolate Milk Day (September 27th)... How about an Mmmm-Mmmm Mexican Hot Chocolate? Get the party started… Click "Send to a Friend" now!